A coursing club reported to Minister Heather Humphreys for an apparent breach of its licence conditions has not only avoided a penalty but has incredibly been given a special licence to hold its coursing meeting a week early. ICABS reported the County Kerry club to Minister Humphreys and the National Parks after noticing in a document obtained under Freedom of Information that they caught 15 hares on August 15th last - the day before the date specified on the 2014-15 licence. Minister Humphreys had previously stated that breaches of licence conditions would no longer be tolerated. We therefore urged the Minister to prosecute Kilflynn and another 30+ clubs connected to breaches / suspected breaches of conditions and to exclude them all from any further licences. But the Minister's announcement about getting tough with clubs breaching the flimsy licence conditions has again turned out to be as hollow and meaningless as her previous statements. For example, around the time she issued last year's coursing licence, and with no hint of irony, she actually expressed concern that cruelty to wildlife "harms our reputation as a country that values its wildlife". 48 hours before granting that licence, she was quoted in the media as saying that she found the persecution of wildlife to be "intolerable". Sadly, not intolerable enough for her to stop licensing cruel hare coursing or, at the very least, sanction the clubs breaching licence conditions. The open season for shooting, hunting and coursing hares begins on 26th September. That didn't suit Kilflynn coursing club so they applied - and were duly granted - a licence to hold their meeting a week earlier than that. This "out of season licence", issued by Minister Humphreys and signed by Gerry Leckey of the National Parks and Wildlife Service, "grants to Kilflynn Coursing Club...a licence to hold regulated coursing matches on 19th September and ending on 20th September 2015". And in what appears to be a further favour to Kilflynn, the date on the general hare netting licence has been brought forward by over a week, meaning the persecution of hares by coursing clubs now extends over a 29-week period. This outrageous outcome provides yet more proof that the licence conditions attached to the coursing licences are not worth the paper they're written on and that instead of protecting hares from their persecutors, the Minister for Arts & Heritage and the Wildlife Service are facilitating their suffering and bending over backwards to accommodate those carrying out the cruelty. Urge Minister Heather Humphreys to intervene to stop Kilflynn hare coursing meeting from going ahead. I am writing to urge you to act to prevent the Kilflynn hare coursing meeting from going ahead. You have previously insisted that breaches of coursing licence conditions would not be tolerated. Contrary to last year's licence conditions, Kilflynn netted hares from the wild before the date specified in the licence. I urge you to prevent the Kilflynn coursing meet from going ahead and further urge you to revoke the licence you granted for a 2015-16 coursing season. In coursing, hares suffer at all stages - during the capture, during the time they are kept in captivity and during the coursing meetings where they run for their lives in front of greyhounds. Among the injuries recorded are broken legs, damaged toes and dislocated hips. Every season, hare injuries and deaths are documented. It is a shame that instead of protecting hares, you are facilitating cruelty against them. Numerous breaches of last year's coursing licences. What will Minister Humphreys' response be? Among the breaches of a hare coursing licence issued by Minister Heather Humphreys last year was a coursing club netting 15 hares on a day outside the period allowed by the licence. Just one of numerous licence breaches highlighted in an ICABS report submitted to Minister Humphreys as part of a renewed appeal to her to stop licensing the bloodsport. We reminded her of her previous assurance that licence breaches would no longer be tolerated. "Kilflynn coursing club captured 15 hares on 15th August 2014 - the day before the licences allowed," we pointed out, providing an extract from a club document which clearly confirms the breach. According to the licence, "The Minister for Arts, Heritage and the Gaeltacht authorises the Irish Coursing Club to attach a tag or other marking device...during the period beginning on the 16th day of August 2014"
Other breaches flagged in our report include failure to cooperate with NPWS personnel, failure to provide particulars of hare captures, the release of hares outside daylight hours, the presentation of inaccurate or incomplete veterinary reports, the failure to carry out post mortems on hares who were killed, etc. There are also additional suspected breaches relating to the presence of injured and pregnant hares in coursing compounds. In our appeal to Heather Humphreys, we said: "Minister, you have previously stated that breaches of licence conditions will not be tolerated. We therefore expect you and the National Parks and Wildlife Service to take the identified licence breaches very seriously by initiating prosecutions against the relevant clubs and excluding them from any further coursing licences. Given the routine licence breaches, the unenforceability of licence conditions and the ongoing suffering, injury and death caused to hares, we implore you to reject the current licence application for a 2015-16 coursing season. This would be greatly welcomed by the majority of Irish people who are in favour of a ban on hare coursing." Urge Minister Heather Humphreys to show compassion for the persecuted Irish Hare and stop licensing cruel coursing. I am one of the majority who want hare coursing outlawed in Ireland. 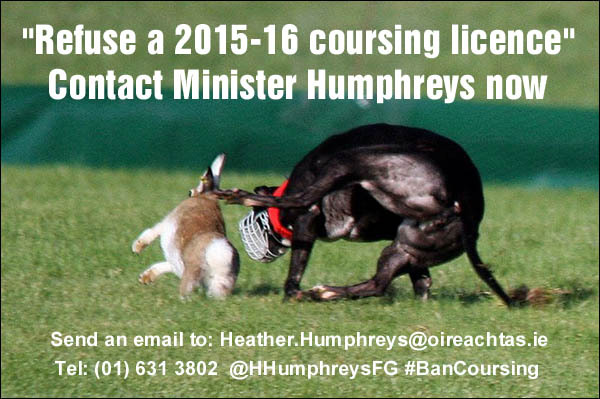 I am writing to urge you to reject a licence application for a 2015-16 coursing season. In coursing, hares suffer at all stages - during the capture, during the time they are kept in captivity and during the coursing meetings where they run for their lives in front of greyhounds. Among the injuries recorded are broken legs, damaged toes and dislocated hips. Every season, hare injuries and deaths occur. I ask you to please act on the wishes of the majority, show compassion and refuse to issue the licence.